Fit ‘N’ Furry is NOT your typical dog boarding kennel. 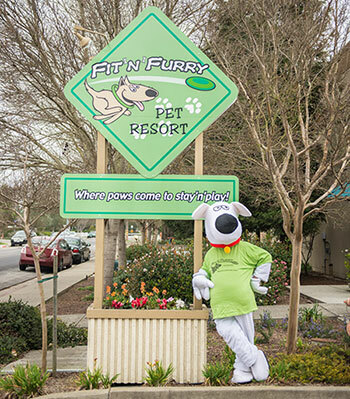 Your pet will enjoy an entirely different and wonderful dog boarding experience at Fit N Furry in Petaluma, CA! Your dog or puppy will be completely safe and secure with a clean, and comfortable place to stay and play. Leading veterinarians and our clients rave about the outstanding quality of our facility and the care provided by our staff. Read these testimonials provided by our guests. Dog Boarding at our state-of-the-art facility in Petaluma is an experience far superior to ordinary kennels. Come by and see why Sonoma and Marin county pet owners choose Fit N Furry! 100% committed to the health, safety and comfort of our guests. All of our rooms are very spacious! Friendly, experienced and certified staff. High efficiency HVAC system promotes optimal health, air filtration and temperature control. We are a GREEN facility: construction, cleaning solutions, water conservation & recycling. Flat screen TV’s in all of our luxury suites. Guests will be served high-quality Pure Vita (grain free) pet food twice a day. You are welcome and we encourage you to provide your dog‘s favorite food during his stay. If you do, we ask that you bag and label each meal. Should your dog have special needs or dietary restrictions, we will provide a feeding schedule tailored to their special needs. We are happy to administer most medications. Please let our Reservation Specialist know about all medications in advance of your dog’s stay with us. Rooms are cleaned daily, or as often as is necessary to ensure guest‘s comfort and cleanliness. We use only green, environmentally-friendly cleaning products to ensure the best care and safety for our guests and to protect the environment. We believe an active dog is a happier, and healthier dog. Take a look at the activity options available during your best friend’s stay. We chose Fit'n'furry based on yelp reviews & proximity to my mother's home. We live in Berkeley and when we visit my mother we sometimes need to have Allie in daycare or boarding. Additionally, we had a good interaction with the dog-to-dog introduction staff member named Josue and that was reassuring! It clinched the deal. My family and I went on a 1-week vacation out of the country and they made it stress-free the whole time I was there. I kept in contact with them via email. I will recommend them always and look forward to planning another vacation and not have to worry about where to take my dog. Q: What will my doggie be fed while at Fit ‘N’ Furry? A: Guests will be served nutritious meals twice a day. We serve high quality Pure-Vita pet food at Fit ‘N’ Furry. You are welcome and we encourage you to provide your dog‘s favorite food during his stay; if you do we ask that you bag and label each meal. Should your dog have special needs or dietary restrictions, we will provide a feeding schedule tailored to their special needs. Q: My dog requires medication. Are you able to administer his medication? A: Absolutely. We have staff members qualified to administer most medications guests may need. Just be sure to let our Reservation Specialist know in advance of your dog’s stay with us. Q: How old does my puppy need to be to stay at Fit 'N' Furry? A: Puppies must be 16 weeks of age to stay. Q: Does my dog have to be spayed or neutered to lodge at Fit ‘N’ Furry? A: All are welcome because we have separate rooms for each dog or family of dogs. 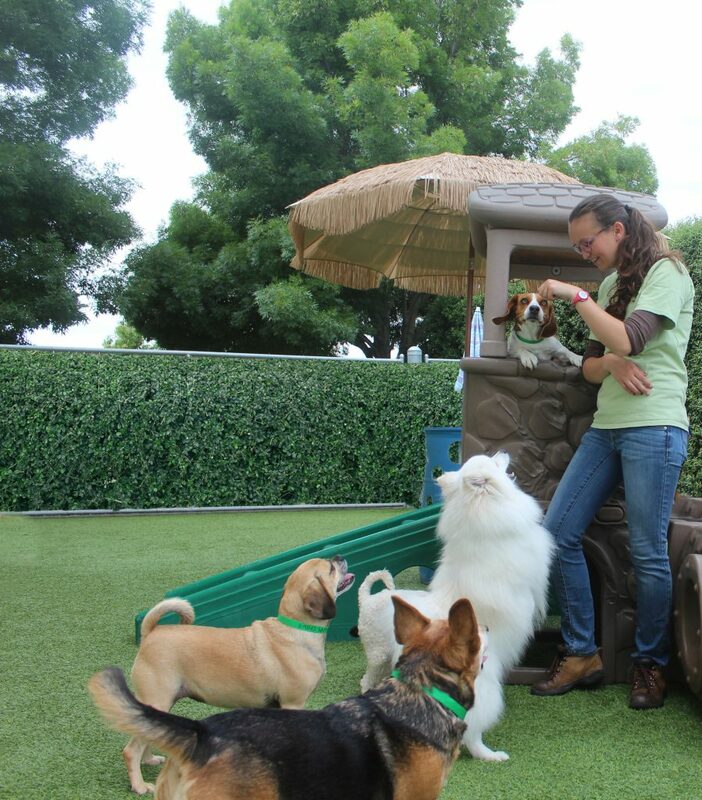 Intact dogs can stay and experience great comfort and special activities at Fit ‘N’ Furry. Q: What vaccinations are required for my dog to lodge at Fit ‘N’ Furry? A: For the safety of all of our guests, we require proof of up-to-date Canine Influenza Virus vaccinations H3N8 and H3N2, Rabies, DHLPP and Bordetella vaccinations. (We highly recommend a Bordetella booster every six months.) For guests under six months of age proof of vaccinations series administered. You must provide a copy or faxed copy of up to date vaccination history at the time of reservation and at least 1 week prior to boarding time period. If you ask your veterinarian they may offer to FAX your dog‘s vaccination records to us directly at . Q: Sometimes my dog can be a bit of a pill when we’re away. Can my dog lodge with you? A: Please let our Reservation Specialist know when you call so we can answer all of your questions. Q: My big dog can sometimes be a little scared around other bigger dogs, and my little dog thinks he’s a big dog. What group will he be in during his stay? A: Play groups are separated by dog size, activity level and temperament. We keep a close eye on them during their entire stay to make sure they’re having fun and that all of our guests are safe. Q. How often will my dog get exercise? A. Multiple activity packages are available for you to choose from when you finalize your reservation. We want to make sure your dog receives the same amount of activity while you’re away as he or she receives while at home. Sometimes even more! We have personal guides to show potential guests our many amenities. Please call (707) 769-7387 to reserve. Well behaved dogs on-leash are always welcome at our facility here in Petaluma, CA!